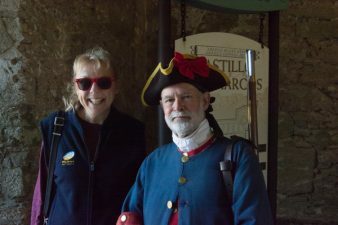 Next up on our adventure with Matt and Sherry is a visit to St. Augustine where we stop first at Castilla de San Marcos a National Park Service Monument and well preserved fort in downtown St. Augustine. We are admiring the elderly fortification (words that I hope I never hear used to describe me) when suddenly there is a ruckus outside. Above the courtyard at the fort’s center is a drone flying above us taking videos. Too bad that the culprit’s camera appears not to have captured the multitude of signs posted ALL around this National Monument forbidding drone flights. Everything settles down once the malefactor is apprehended by the diligent park service rangers and we are able to continue basking in the warmth, sunshine and history of this lovely structure. After all that excitement we decide to stretch our legs with a short hike through the Old City and Shopping District right across the street from the fort before being lured across the drawbridge to the St. Augustine lighthouse beckoning us to scale to its top. We climb 219 steps to reach the red cap and balcony of this Cape Hatteras like striped lighthouse and the view from the top is worth every groan and gasping stride. Life begins when a person first realizes how soon it ends.